Colorado state law requires all regulated cannabis products be returned to the original dispensary license from which the product was purchased. The Green SolutionÂ® offers store credit when returned to the exact location the purchase was made, otherwise this exchange policy become void, without exception. MED compliance requires all regulated cannabis products be returned to the original dispensary license from which the product was purchased. TGS offers store credit when an item is returned with a receipt to the exact location the purchase was made, otherwise the exchange policy is void, without exception. 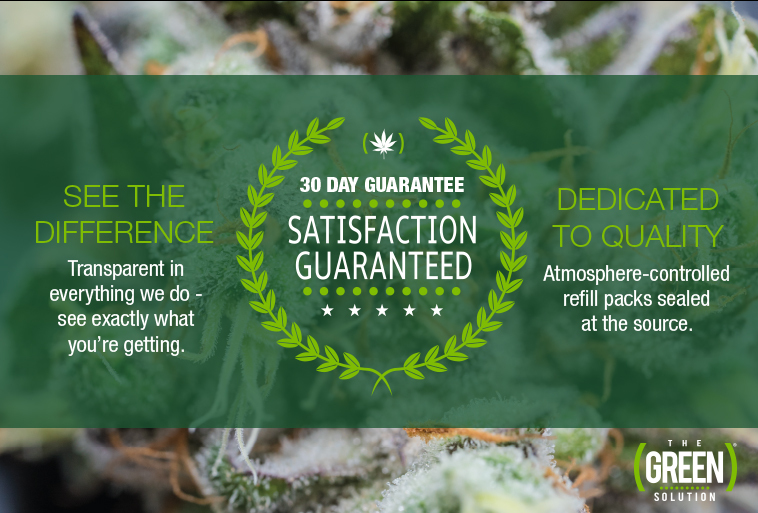 30-day exchange on all cannabis products, except as noted below. 7-day exchange on electronic accessories and (GREEN) Geneticsâ„¢ Clones/ Seeds/Pollen. All Sales Final on Apparel, Glass, and Non-Electronic Accessories.